A melanoma diagnosis is assigned to one of five main stage groups, Stages 0 to IV. Each stage encodes a description of the severity of a patient's melanoma disease process and how far it has spread from the primary site. It defines the potential of the melanoma to cause harm, predicts the outlook (prognosis) for the patient and guides treatment options. When a skin lesion appears to be a melanoma, early diagnosis and precise staging improves the chances of successful treatment. The melanoma stages are based on the 2010 standardized TNM cancer staging system. This was jointly decided on by the American Joint Committee on Cancer (AJCC) and the Union for International Cancer Control (UICC). Thick (greater than 4 mm) or ulcerated (even if only microscopic) melanomas and actively dividing or disordered melanomas have a greater potential to invade and spread. Thin tumors (less than 1 mm) and non-ulcerated tumors are less likely to spread and have better cure and recurrence rates. Intermediate tumors (1-4 mm) lie in between. Once the melanoma has spread to nodes and metastasized to distant sites, it is harder to treat. Information gathered in the staging process are grouped together by severity under a melanoma stage. Melanoma begins in the melanocytes cells near the lower or basal layer of the epidermis, the upper layer of skin, and then spreads to other layers of skin and then to other sites. 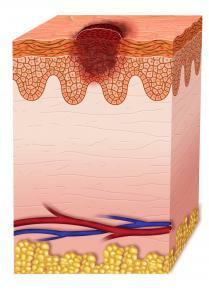 Stage 0 melanoma, melanoma-in-situ, or pre-cancer is confined to melanocytes within the epidermis. Because this stage is not invasive into other skin layers or elsewhere, there is 100% cure. 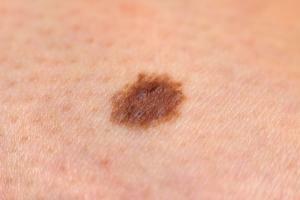 This melanoma may be just a flat area of darkened or discolored skin or start in a mole or freckle. There may or may not be itching of the affected skin and it is unlikely to be ulcerated (breakdown of the surface) or bleed. On physical exam the lymph nodes are not enlarged. 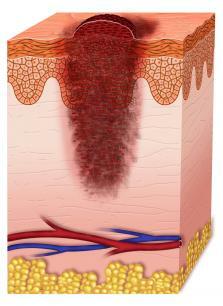 A Stage 0 melanoma biopsy shows more features of cancer than melanoma-in-situ. The melanocytes have abnormal growth features in individual cells and in the arrangement of the cells in the epidermis. There may be occasional mitotic figures but no features of advanced disease on a cell or tissue level. Stage 0 has no subdivisions. 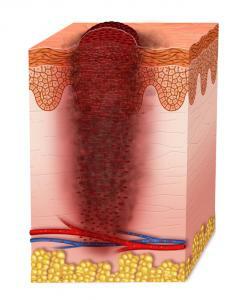 Because Stage 0 melanoma does not spread, excising the lesion is the only treatment needed. 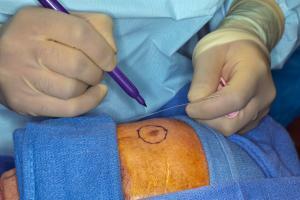 The melanoma is removed with 1-2 centimeters of normal surrounding skin (wide local excision). 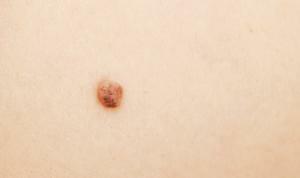 At this stage, the lesion may look like a flat hyperpigmented area only a few millimeters in diameter or it may look like an abnormal, discolored mole or freckle with irregular edges. It may or may not be itchy or ulcerated and may bleed if ulcerated. There are no symptoms of disease elsewhere and the lymph nodes are not enlarged on exam. Biopsy findings: In a Stage I biopsy, the microscopic thickness of the lesion is less than 2 millimeters (mm). Melanocytes in the tumor have more abnormal growth features, typical to cancer cells, than Stage 0 melanoma. Only a few cells have mitotic figures because the cells are dividing slowly. Lymphatic mapping and sentinel lymph node biopsy (SLNB): Though the likelihood of Stage I melanoma spreading is low, after the initial biopsy diagnosis some doctors may recommend lymphatic mapping and SLNB (removal of the sentinel node) to look for microscopic cancer for more precise pathologic staging and treatment plan, especially for lesions greater than 1 mm and ulcerated lesions (Stage IB). Surgical excision of melanoma: The primary treatment of Stage I melanoma is a wide local excision of the tumor along with 1-2 cm of normal skin around it depending on the size and location. This is usually done with a local anesthetic. Sentinel lymph node biopsy: If the doctor recommends lymphatic mapping and SLNB as part of the staging it is usually done at the time of, and before, the wide local excision. If the sentinel node is positive for cancer cells on mapping, it is removed as part of the treatment plan. Note that the value of lymph node mapping and SLNB for Stage I melanoma is controversial but some studies show that removing the sentinel node in patients with Stage I or Stage II melanomas identifies patients who may need additional therapy, decreases the risk of recurrent melanoma and may improve survival. Lymph node dissection: If the sentinel node biopsy shows melanoma, a complete regional lymphadenectomy may be done another day. If the mapping is negative, those patients avoid the complications of removal of all the nodes in that grouping. Lymphadenectomy for Stage I melanoma is also controversial but may improve the outcome for some patients with thicker melanomas. Additional (adjuvant) therapy: Some doctors may choose to give adjuvant therapy using an immunotherapy drug such as interferon to boost the immune system to help fight the disease if there is evidence of microscopic disease in the nodes or for thicker or ulcerated Stage I melanomas. 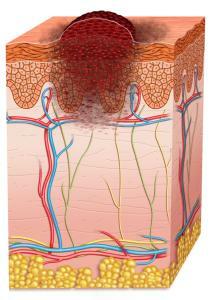 Stage II melanomas are usually more than 2 centimeters in diameter on the skin. The tumor may have multiple, irregular colors (variegated) and a more irregular border than Stage 1 lesions. It can be itchy, may or may not be ulcerated, and may also bleed. There are no symptoms of spread to other organs and the nodes are not enlarged. Biopsy findings: A stage II melanoma is thicker than 1 millimeter and may be more than 4 mm on microscopic exam of the biopsy specimen. The melanocyte cancer cells are more abnormal and their arrangement in the tissue is more disordered. There are more mitotic figures than Stage 1 because the cells are dividing faster. Lymphatic mapping and sentinel lymph node biopsy: Because a Stage II melanoma is capable of spreading, some doctors may recommend lymph node mapping and sentinel node biopsy (SLNB) to look for evidence of microscopic cancer in the lymph nodes near the melanoma. This determines whether these local nodes should be removed and if the patient should be given additional therapy after excision of the melanoma. Sentinel lymph Node Biopsy: If the doctor recommends lymph node mapping and SLNB it can be done at the time of and before the wide local excision. If the lymphatic mapping shows evidence of cancer in the sentinel node(s) the node(s) are removed. There is evidence that the presence of microscopic cancer (micro-metastases) in regional lymph nodes worsens patient outcome, so SLNB is felt to be useful in Stage II melanoma. Additional (adjuvant) therapy: If there was microscopic tumor in the nodes, some doctors may also choose to add immunotherapy such as interferon to boost the patient's immune system to attack the disease or radiation. 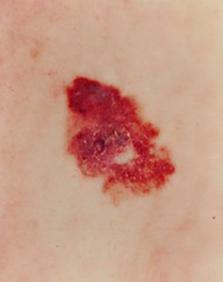 In Stage III, the melanoma has spread outside the primary lesion. The spread (regional invasion) is to skin (satellite lesions), or to lymph nodes in the skin close to a tumor, or cancer cells are present in nearby lymph vessels traveling towards (in transit to) lymph nodes. The nodes may be enlarged (macroscopic node involvement) or there is evidence of cancer cells in them only under the microscope (micro-metastases) involvement. There is no spread to distant skin, distant nodes or other organs. 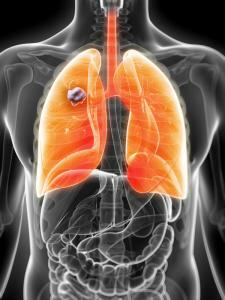 The five-year survival rate is 40-78% for Stage III melanoma. Stage III melanomas are generally greater in diameter and may or may not be ulcerated. However even melanomas that look small on the surface can still spread. The lesion has a greater variety of colors, is more irregular in the distribution of the colors and in the shape of the border. They may itch and bleed because of an ulcer or become painful. Enlarged lymph nodes may be felt on exam near the region of the melanoma and may or may not be painful. There may be pain at the site(s) of skin invasion. On microscopic exam of the biopsy, in Stage III melanomas the cells are more abnormal and disordered than earlier stages. There may be more mitotic figures as the cells are dividing more aggressively. If nodes are not obviously enlarged the doctor might suggest lymph node mapping and SLNB to look for micro-metastases in lymph channels and nodes near the melanoma, as part of the staging. If the sentinel node(s) has micro-cancer it is removed. Some doctors also remove all the other nodes in that lymphatic chain (elective node dissection) as there is a greater chance of further metastases with Stage III melanoma. Other tests to rule out spread to distant lymph nodes and other organs may include: chest X-ray, CAT scan, MRI scan or PET scan. Stage III melanoma is subdivided into worsening stages depending on the ulceration of the melanoma and the degree of local invasion in skin and the number lymph nodes involved. There are small secondary skin tumors in or under nearby skin two centimeters or less from the primary site. The nodes may or may not be enlarged. There are several options for treatment of Stage III (and Stage IV) melanoma. Surgery is the primary treatment for Stage III with additional (adjuvant) therapy based on the amount of local spread, tumor ulceration and extent of node involvement. Biotherapy/Immunotherapy: Immunotherapy uses biologic factors to induce or direct the patient's immune system to fight the melanoma. Melanoma therapies in this class include ipilimubab, interferon, interleukin-2 (IL-2) and the Bacille Calmette-Guerin (BCG) vaccine (a tuberculosis vaccine). Targeted therapy: Targeted therapies include drugs or other factors that interfere with the division and growth of cancer cells and not normal cells. These can be given through the blood circulation or injected into the tumor. Options include using vemurafenib and dabrafenib against melanomas with the BRAF V600E gene mutation, or injecting the BCG vaccine, interferon or interluekin-2 or using imiquimod cream or other approved melanoma drugs. With Stage IV melanoma, the tumor has spread through the lymphatic system or the blood vessels to other parts of the body (distant metastases), including skin away from the primary melanoma, distant lymph nodes and other organs (distant invasion). The most common organs for melanoma metastases are lung, liver, brain, bone and bowels in descending frequency. In Stage IV, there is less chance of a cure and a greater chance the disease will recur. By the time a melanoma reaches Stage IV, the survival rate is only 15-20%. 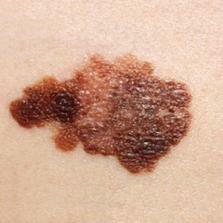 A stage IV melanoma lesion may be larger and more variable in shape color and border than earlier stages. The lesion may be itchy and painful. It may bleed and may or may not be visibly ulcerated. Other symptoms of this stage depend on which organs the melanoma has spread to and include head, bone or bowel pain and respiratory symptoms. With Stage IV melanoma, the primary tumor can be any thickness on microscopic exam and may or may not be ulcerated. Typically at this stage the tumor is thick and has already spread to nodes near the tumor. Neither thickness nor ulceration is taken into account in Stage IV. The cells in the tumor have even greater abnormal growth features and the tissue is more disordered than earlier stages. There are more cells with mitotic figures because cancer cells are dividing even more aggressively. Stage IV is further subdivided based on where the metastases are and the result of the LDH blood test. 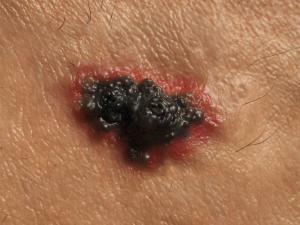 The melanoma thickness or ulceration and the spread to nearby nodes are not considered in this stage. The higher the stage, the more critical it is. Targeted therapy: These therapies target cancer cells to prevent them from dividing or growing and don't interfere with normal cells. Drugs for melanoma treatment include vemurafenib and dabrafenib, which target melanomas with the BRAF V 600E gene mutation. Biologic/Immunotherapy: This treatment induces or directs an immune response to kill cancer cells. Options include ipilimumbab, interleukin-2 (IL-2), or newer forms of drugs. Immunotherapy does not appear to cure tumors, but can help shrink them. Systemic chemotherapy: Drugs such as dacarbazine treat metastases that can't be removed. Chemotherapy is not as effective as other therapies, as tumors tend to regrow within six months. Surgery: Surgery may be used to remove the primary tumor and metastases in other locations, including lymph nodes and internal organs such as lungs, brain, bowel and bone to relieve symptoms (palliative treatment). The stages of melanoma are specific, well-defined, and standardized, taking into account the microscopic behavior and progression of the disease. An early disease stage at first diagnosis improves a person's chance of survival. Timely evaluation and accurate staging are vital to a patient's outcome. Melanoma can spread aggressively so early detection and treatment can save your life. See your doctor promptly for any new skin lesions or old ones that are evolving in color, size or shape. It is even more important to assess your risks for melanoma and take steps to reduce them, especially if you are at are at high risk.